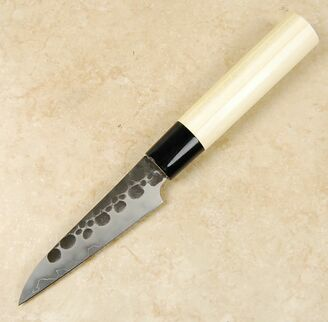 A new addition to the Tojiro line of VG10 hammered knives is this fun and functional 90mm petty. This baby is about as short as a petty gets. As such, it can double as an in-hand paring knife. It is a very small knife, but that smallness translates to big abilities in the kitchen. The short and stout blade can get into all sorts of tight spaces, like cutting around bones, while it is also able to tackle the finest and most intricate garnish preparations. The blade is constructed from VG10 and a san mai sandwich of a soft stainless steel. 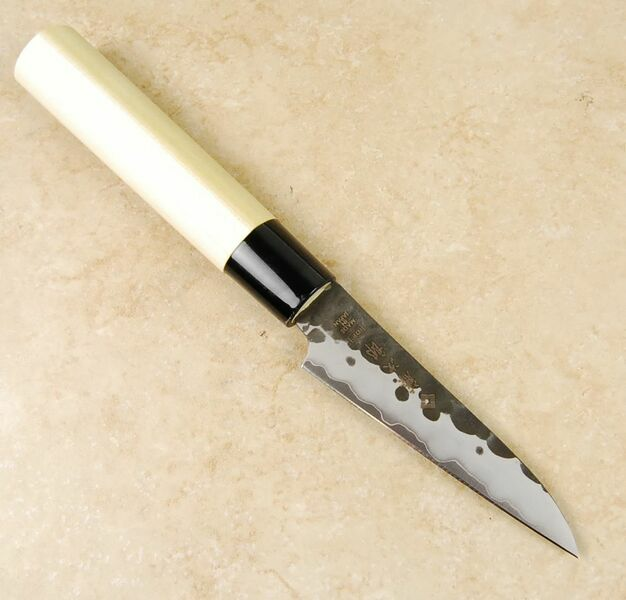 VG10 is one of the most popular stainless steels used in the making of Japanese knives. It is highly regarded for it good edge retention, toughness, and superior stain resistance. It also gets really sharp. The soft stainless cladding is treated to a cool looking kurouchi hammered finish which adds character and a certain amount of extra food release. This basic knife comes with a simple handle that is easy to hold and control for extra security when performing in-hand work. 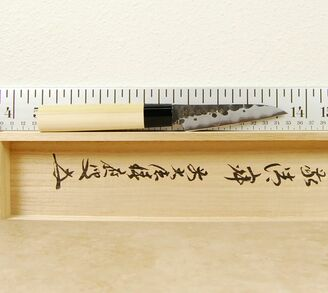 At the price, this little cutter can be used in many places where one would not necessarily take a more expensive blade.